Russian military television, TV Zvezda, not long ago ran a 35-minute show on the construction and acceptance of Borey-class SSBN Vladimir Monomakh in Severodvinsk. Pretty interesting footage showing test launches of Bulava SLBMs and engineers checking design specs on reams of paper documents. Props to someone for putting the video on YouTube. The program follows MOD military representatives, civilians, and crew through the final process of delivering and accepting the new submarine into service. It also has footage from Votkinsk showing the manufacture of Bulavas for the Borey-class. 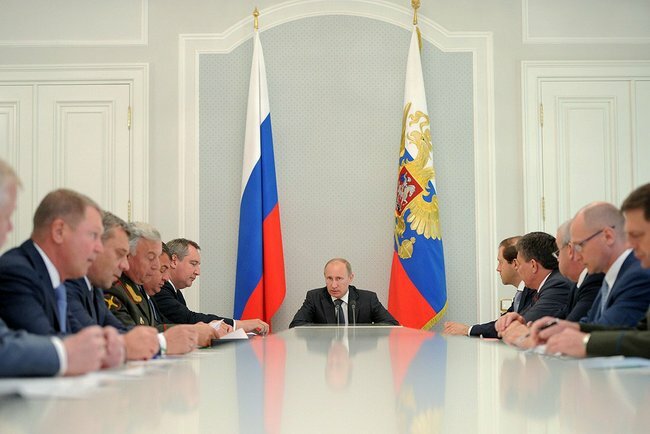 Today’s meeting on implementing GPV-2020 (the third thus far) was devoted to nuclear forces and aerospace defense. However, President Vladimir Putin had little specific to say, at least in his published remarks. He obligatorily noted how VVKO and especially SYaS bear “special responsibility” for Russia’s security, territorial integrity, and global and regional parity and stability. In other words, lots of air and aerospace defense assets don’t belong to VVKO, and their job is to integrate them into a network. To reequip SYaS and VKO, the Supreme Glavk indicated Russia intends to allocate a “significant part” of the total resources for GPV-2020, but, again, nothing more specific. By 2020, SYaS is supposed to have 75-80 percent modern weapons systems, and VVKO not less than 70 percent. And that’s all we learn about the meeting. Or almost all. Kremlin.ru provided a participant list that’s a bit interesting. Many officials and industry leaders you’d expect attended. But some were noticeably absent — missile designers from MIT, missile builders from Votkinsk, and the RVSN Commander. Surprisingly, the general director of the Makeyev design bureau was present. Leonid Ivashov recently talked to Narodnyy politolog on a variety of army topics including reforms, the possibility of a big war, rearmament, president-elect Vladimir Putin, and his military program. Segodnia.ru also printed the interview. Once Russia’s top military diplomat, now avowed geopolitician, the former three-star thinks Putin fears externally-driven regime change and is improving the army to forestall such an eventuality. Ivashov sees a U.S.-led West depriving Russia of allies before focusing on Russia itself. Asked about army reforms, Ivashov says they have succeeded in cutting forces, but not in rearming them or improving their social conditions. Reforms have degraded and weakened the army. Military men mock the New Profile reforms saying, “There’s a profile, but not armed forces.” Ivashov calls reforms craziness, and says it’s like servicemen have lived in a house under continuous repair for 25 years. Following up his comment on mobilization reserves cut to the bare minimum, NP asked the retired general-colonel if a big war is possible today. Ivashov foresees a large conflict between the U.S. and China and possible spinoff regional and local wars. He cites a Chinese specialist who calls for a Russian-Chinese alliance to deter a big war and curb the appetite of the West and international oligarchs. Ivashov calls Putin’s military program ambitious, if not systematic. The regime’s been in a “light panic” since Libya. He intimates that more than 20 percent of the state armaments program will be stolen since the amount of theft cited by the military prosecutor covers only cases under investigation, not all corruption. Ivashov suggests lobbying has replaced forecasts of future military actions as the driver of arms procurement. The case of Mistral, which one wonders where it will be built and how it will be used, Ivashov says well-connected lobbyist structures ensure what gets produced is exactly what their enterprises make. He was somewhat encouraged that Putin, at Sarov, entertained turning to specialists and experts to examine the army’s requirements. On GPV 2020, Ivashov concludes it’ll be a serious step forward if only half of what’s planned gets produced, but it can’t be equipment designed in the 1970s and 1980s. He sees OPK production capacity problems too. He questions whether Votkinsk can produce 400 solid-fueled ballistic missiles by 2020. Ivashov’s just a little up in arms over the armor situation. He all but accuses the General Staff Chief of being a paid (or bribed) lobbyist for foreign tank and armored vehicle makers. 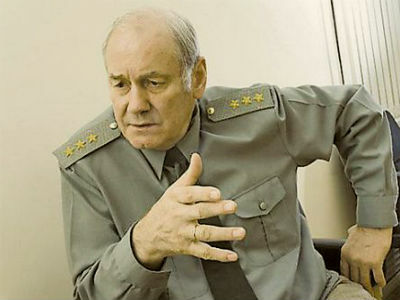 He suggests that Army General Makarov should be placed in cuffs if he says the Leopard-2 is better than the T-90 [what about Postnikov then? ], and the Main Military Prosecutor should investigate him. So what is to be done first and foremost to strengthen the country’s defense capability today? Ivashov replies get rid of Serdyukov and Makarov who have done great damage, and strengthen cadres in the OPK and military by replacing “managers” with those who can apply military science (as Ivashov was taught) to the problem of developing new weapons. The always provocative Ivashov doesn’t venture whether he thinks the current emphasis on defense capability will continue or have the intended results. He seems sincerely to believe in a possible Western intervention in Russia’s internal affairs. But it’d be more interesting to hear him talk about whether the army would fight for Putin’s regime in something less than that maximal contingency. Ivashov, unlike some critics of Russia’s defense policy, shies away from blaming the once-and-future Supreme CINC for at least some of the current military state of affairs. Bulava designer Yuriy Solomonov seems to have come out from underground now that the Bulava SLBM has some successes under its belt. Yesterday the Russian media carried excerpts from a soon-to-be-published interview with Igor Korotchenko’s Natsionalnaya oborona. Solomonov already has a book about his adventures in missile design to his credit. The only thing that’s changed is the Bulava program seems to be righting itself. Solomonov said, not surprisingly, that the Bulava’s warheads are ready, and he expects the missile to stay in the inventory until 2050. Solomonov said Borey-class SSBN Yuriy Dolgorukiy will begin (like Dmitriy Donskoy did) with a surface test launch. But he doesn’t rule out that this could be changed to a submerged launch. The tentative date is 17 December. In the interview, Solomonov apparently will talk about how Bulava could be adapted into a ground-launched missile. This brings back the whole issue of “inter-service unification,” which led to some of the excitement with Bulava. Svpressa.ru and Anatoliy Tsyganok have a good time lambasting Solomonov for this (again) if you want to take a look.